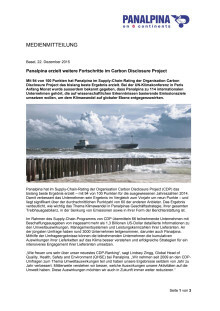 Panalpina has received its highest Carbon Disclosure Project (CDP) supply chain program score yet – 94 points out of 100 for the reported full-year figures from 2014. 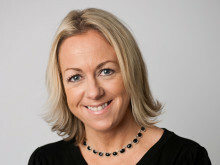 Panalpina’s score is a nine-point improvement on last year’s score – and significantly higher than the average supplier’s score of 60 – demonstrating the extent to which climate change is integrated into the company’s business strategy, its overall performance in greenhouse emissions and emission reductions, and its reporting methodology. Under the CDP supply chain program, 66 member companies, representing more than US$1.3 trillion in procurement spend, ask their suppliers to provide detailed information about their environmental impact, management systems and performance metrics. Almost 3,000 participants, including Panalpina, responded to the latest survey. 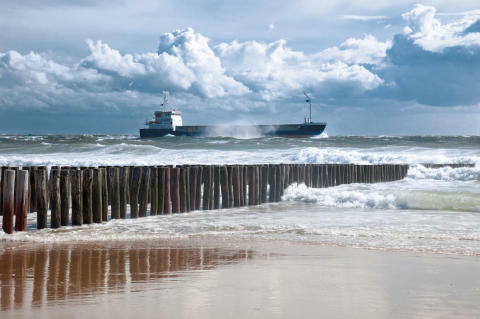 The results of the survey enable the member companies to better understand the cumulative climate impact of their supply chains and to implement successful supplier engagement strategies. Panalpina has committed to set emissions reduction targets in line with what the Intergovernmental Panel on Climate Change says is necessary to keep global warming below a dangerous threshold. According to this panel of scientists, global greenhouse gas emissions must be cut by up to 70% by 2050 to limit global warming to 2 °C and avert irreversible climate change. Earlier this month, at the UN Climate Talks in Paris, the Science Based Target initiative announced that 114 global companies including Panalpina have committed to set ambitious targets that are in line with this goal. The initiative, a joint effort of CDP, UN Global Compact, World Resources Institute and WWF, only approves corporate targets that meet its strict criteria. The targets must cover a minimum of five years and companies are encouraged to develop long-term goals as well. Panalpina is going to set its science-based emissions targets in the first half of 2016. One way in which Panalpina reduces its environmental impact is through PanGreen, a comprehensive environmental and sustainability initiative that includes efforts to expand energy and greenhouse gas monitoring systems and subcontractor engagement. As part of the initiative, Panalpina also raises its employees’ awareness of environmental issues via a Global Environment Day. 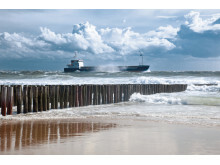 For customers, Panalpina launched a new advanced CO2 calculation tool for their shipments in 2014. In December 2015, Panalpina joined other international companies in the Science Based Targets initiative.